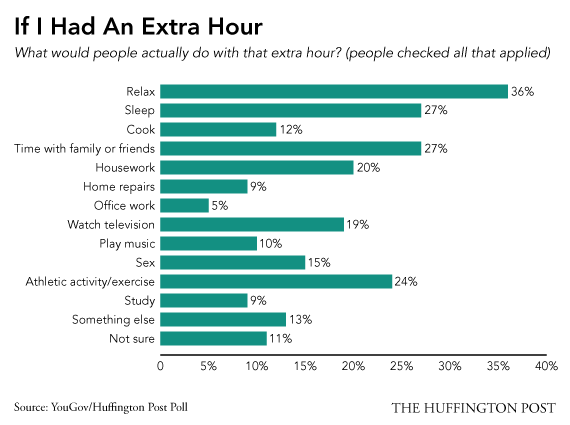 HuffPost Poll: What Would You Do With An Extra Hour Every Day? If you had an extra hour each day, how would you use it? Would you take a significant pay cut if it meant you could work one day less each week? And what does your geographic location have to do with how much time you have to do the things that are important to you? The poll was conducted in response to a thought-provoking piece on the website ForbesWoman, called “R.I.P Work-Life Balance.” Contributor Kristi Hedges argued that our goal as individuals and as a society should not be an abstract idea of “balance” -- with equal allotments for home and work -- but rather giving workers the flexibility to “live full lives as they see fit.” To measure that, she suggested several guideline questions -- measuring energy, engagement and time. If you have those, she wrote, you have it all. So, we wondered, how many of us actually HAVE those things? And if we could gift ourselves more time, how would we use it, and what would we be willing to give up?